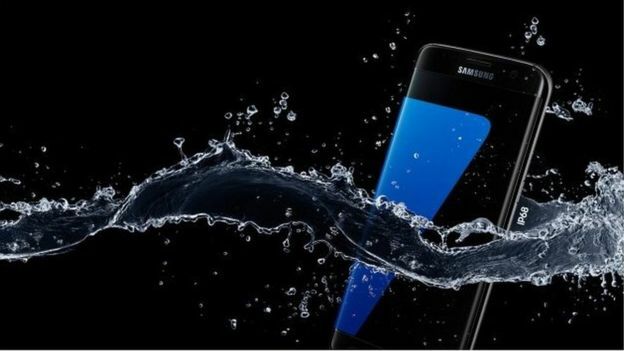 The Samsung Galaxy S7, S7 edge and S7 Active, being one of the very best water-resistant smartphones with an IP rating of 68, surviving 30 minutes in five feet of water. The phone company reportedly launched an investigation after two phones failed a Consumer Report Dunk Test, after which a manufacturing problem, that caused the Galaxy S7 Active phones to fail in the underwater conditions it was built to withstand, was observed. Consumer Reports placed the device in a tank filled with just under 5-feet of water, pressurized to 2.12 pounds-per-square-inch. A timer was set at 30 minutes. After the timer went off and the phone was removed from the tank, green lines covered the screen, and bubbles were seen inside the back and front-facing camera lenses. The test was repeated with a brand new Samsung Galaxy S7 Active. Another test failure as the screen blinked on and off. Water was spotted on the SIM card holder and moisture could be detected in both camera lenses. Both tested phones never functioned properly again. The factory problems were immediately corrected about one week after the results were published on July 8. Samsung said they will replace any phone under warranty that sustains water damage. The Samsung Galaxy S7 and the Samsung Galaxy S7 edge reportedly played the role of surviving the immersion and test conducted by Consumer Reports. A public relations manager for Samsung, Phil Berne, said compared to the total number of Galaxy S7 Active phones sold, only a tiny percent were returned with water damage. Samsung was not offering to replace devices that have not suffered water damage. Berne said. “We don’t want people to think there’s the necessity of returning their phone.” The Samsung Galaxy S7 Active is only sold in the US on the AT&T network, with all of these devices made in the same facility in Asia. Philip Berne, also stated, "We found a problem in the production line that we were able to correct." Phones shipping now should retain the rated water resistance. Therefore if you currently own a Samsung Galaxy S7 Active, and it suffers water damage, then you can go to the store where you purchased it or to Samsung to get a free replacement.